Fact: Australia is a sporting mad country. They put on one of the best-run Olympics in ages, their teams always excel and (using the Olympics as a barometer) Australia is always one of the best-performing sports countries (per capita) in the world. Throw in their high level of performance at sports most Americans haven't heard of like Rugby and Cricket and it all adds us to an incredibly full-on sports country. We'd gotten good seats, about 15 rows or so away from the field. Primo locale to take in the high flying, non-stop action. We'd watch those seats the rest of the night with a tinge of sadness as heavy rains had us retreating to the covered general admission section. Sure we had to jerk our heads around a support column to see one of the goals but it beat the heck out of sitting outside in conditions that had us increasingly looking out for animals roaming two by two across the pitch. Usually AFL teams average approximately 100 pts/side a match. The Swans and Saints were just able to break it combined with St. Kilda holding on for a 52-50 victory. Not exactly the action packed game I'd promised Becca but it gave her a good opportunity to see a match live. More Swan Lake than Thriller. But still interesting enough to keep us there for the full 120 minutes. Though I'm sure staying dry under the cover of the stadium helped. 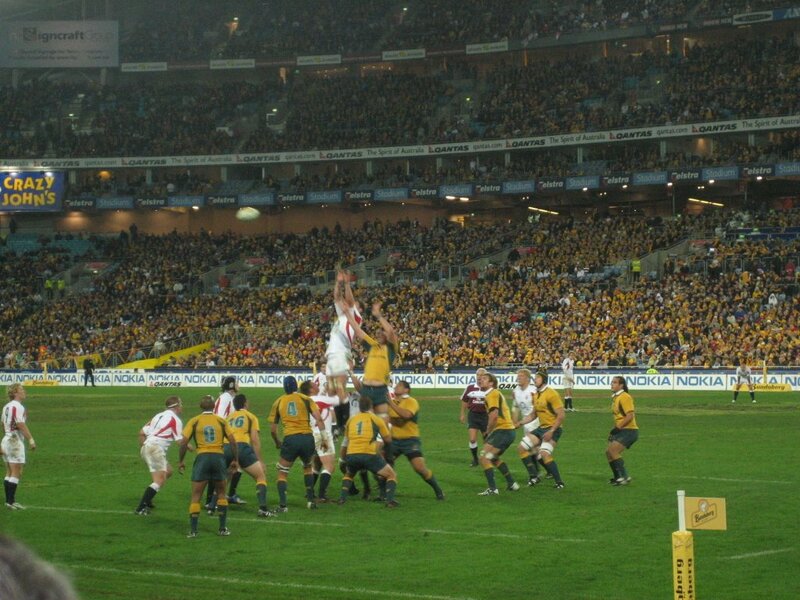 The following night brought a visit out to Telstra Stadium for a Rugby Union Test between the Qantas Wallabies (Australia) and the England Lions. Telstra is the new name for the former Olympic Stadium so courtesy of my old grad school roommate Chris, we got a chance to see a rugby match up close and personal. For those not in the know (which is 99% of the readership), there are two types of rugby: rugby union (what we in the States know as rugby with the scrums and general pileups) and rugby league. Kind of like test and one-day cricket really. Hey, if I could think of a non-commonwealth comparison, I'd use it allright? Same game in theory just a number of different rules and styles. People do occasionally switch codes but for the most part stay with one or the other. 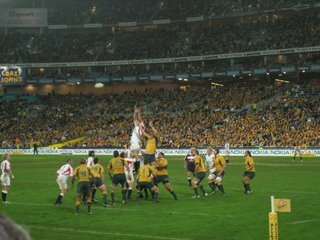 The match had plenty of good plot lines: it was the first match for the new Australia coach and it was also the first match for England here since they'd beaten the Aussies in the previous Rugby World Cup. Thankfully the weather decided to cooperate a bit this time around and we were treated to a perfectly clear night which allowed us to stay in our primo seats (again, much thanks to Chris). Unfortunately the match didn't do much to allow us to get out of them. A comedy of errors between the two teams led to a 9-0 halftime score before Australia got a couple of late tries and pulled away comfortably 34-3. PA: Now, making his... er. Might need to lay off the schnapps a bit for future games. Still it was an excellent chance to see a game we really hadn't understood to date up close and get a chance to experience the Australia/England rivalry up close. Plus we can now say we've been to Olympic Stadium. All in all a great atmosphere and a good sporting weekend. Properly fried from our big nights out, we still had a bit more sports to experience. Over two nights at the hostel's tv room and Chris's living room we were treated to the good (Australia's soccer team coming from 1-0 down against Japan to score 3 goals in the final eight minutes in a performance that got the bandwagon really going (leading to people predicting victory over Brazil). Might want to still ease off the Schnapps I reckon), the bad (watching Queensland pummel New South Wales 30-6 in Rugby League State of Origin) and the ugly (staying up until 4am to watch a dismal US team get thwacked 3-0 by the Czechs). What's State of Origin, you might ask? Imagine if during the middle of the NFL season, they decided to have a best 2 out of 3 series only consisting of players from Texas high schools playing players from Florida high schools, and that this series meant more to the players than winning the Super Bowl. 'Full-on' does not begin to describe the intensity involved in these matches. Despite the scoreline it was quite a cultural event and all that people were talking about the next day. So in all, 4 football codes in the span of 5 days. A very busy time but a great way to fully immerse ourselves in the Aussie culture. It's going to be tough to top all this action on the remainder of the trip but I'm sure we'll be honorary Aussies and "give it a go"